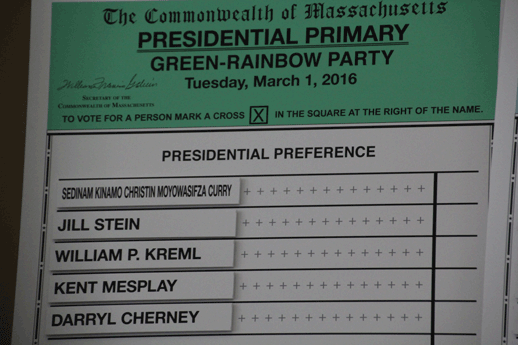 Five presidential candidates will appear on the Green-Rainbow Party’s Massachusetts presidential primary ballot. On December 15, their names were randomly drawn at the State House to determine their placement on the March 1, 2016 ballot. The Green-Rainbow Party is the third largest officially recognized political party in Massachusetts and the only alternative party fielding presidential candidates in the Massachusetts presidential primary. The Party distinguishes itself from other political parties in its calling for a bold transition to renewable energy, a focus on poverty elimination and racial justice, and an end to corporate-controlled and war-dominated politics. Sedinam Kinamo Christin Moyowasifza Curry of Gardena, California brings broad international experience to her work in the United States and Africa. A public school and University of Southern California graduate with advanced degrees, she has a 35-year track record in program/project management, calling on her ability to conceptualize, design, develop, produce, manage, monitor, and evaluate principles, theories, concepts, methods, and techniques in community, public, and media affairs and relations. She has worked for clients in business, trade, promotions, and investment, and in educational, social, environmental, political, economic, cultural-exchange, and heritage-based programs/projects on every level (local, statewide, national, international, and cyber space). As an African-American, Curry has managed projects in a multicultural and interagency team environment. Through her vision, an employee-owned community, public, and media relations firm opened in Ghana, West Africa. That work reaffirmed her belief that “with hard work, conviction, and sincere commitment to realistic goals, visions can become reality.” She has also served as a political strategist for the People’s National Convention, a Ghanaian political party. Dr. Jill Stein of Lexington, Massachusetts was the Green Party’s 2012 candidate for president of the United States. As a mother, physician, and longtime teacher of internal medicine as well as politician, she has led initiatives promoting healthy communities, local green economies, and the revitalization of democracy – addressing issues such as campaign finance reform, green jobs, racially-just redistricting, and the cleanup of incinerators, coal plants, and toxics. She was a principal organizer for the Global Climate Convergence for People, Planet and Peace over Profit. Stein is the co-author of two widely-praised reports, In Harm's Way: Toxic Threats to Child Development, published in 2000, and Environmental Threats to Healthy Aging, published in 2009. The first of these has been translated into four languages and is used worldwide. The reports promote green local economies, sustainable agriculture, clean power, and freedom from toxic threats. Her "Healthy People, Healthy Planet" teaching program reveals the links between human health, climate security, and green economic revitalization. This body of work has been presented at government, public health, and medical conferences, and has been used to improve public policy. As the author of nine books, Kreml’s 1997 work on the middle class was cited several times in Sen. Elizabeth Warren’s book on the same subject. His research and teaching career was largely at the University of South Carolina-Columbia. He combines a long academic career studying the United States government and its problems with active participation in political races, including his own quest for the U.S. Senate in 1980. Dr. Kent Mesplay of Austin, Texas describes himself as a “Cultural Creative,” born in a rainforest and raised on ideas of science blended with intuition, fact with story-telling; guided by a deep curiosity of the role of high technology in society. Schooled in Engineering (Harvey Mudd College, Northwestern University), Mesplay’s Ph.D. is in Biomedical Engineering, with emphasis on prosthetics, biomechanics, and efficiency of natural systems. His parents reminded him that as a boy he wanted to put turbines on the trees in his windy village so that everyone could have electric power. Kent became a registered member of the Green Party when he discovered that the party platform matched his values and concerns: from renewable energy to appreciation of indigenous diversity. He sought the Green Party presidential nomination in 2004, 2008, and 2012. From 2001 to 2015, Mesplay served as an Air Quality Inspector II for the Air Pollution Control District of San Diego County, California. He is a member of Service Employees International Union (SEIU). His perspectives on Climate Change grow out of his observations as a scientist and his Native heritage, teachings, and awareness. Cherney ran for Congress in 1988, when he met fellow activist Judi Bari. With Bari, he organized the Redwood Summer campaign. In 1990, he and Bari were car bombed; he was slightly injured and Bari was severely injured by the explosion. The case was investigated by the Federal Bureau of Investigation (FBI), which accused them of bombing themselves. Bari and Cherney subsequently sued the FBI and Oakland Police agents for violations of the United States Constitution. He and the late Bari's estate were awarded $4.4 million for violations of the First and Fourth Amendments. As a Green Party member since 1990, Cherney held office from 2006 to 2010 on his local healthcare district.